In the last blog I went over loading a planning unit hierarchy directly through planning, today I am going to through the next method and that is the outline line utility. The outline line utility appeared in the first release of version 11, even though a couple of versions late in my opinion it has turned out to be the most useful utility for classic planning, if you need to quickly load metadata and you can generate a fixed format file then it can save a lot of time, especially if you are prototyping. Using the outline utility uses the same principal as the other methods, same source file template, just this time command line driven. The utility is named OutlineLoad.cmd or OutlineLoad.sh depending on OS. An example on how to create the password file is shown below. /D: PlanningUnitName – hierarchy name you want to load to. I don’t need to explain in any further detail the parameters as I feel they are self-explanatory. Before running the utility you will need to make created a default planning unit hierarchy, also make sure that the hierarchy is not being edited in planning when you run the utility otherwise you will receive an error. 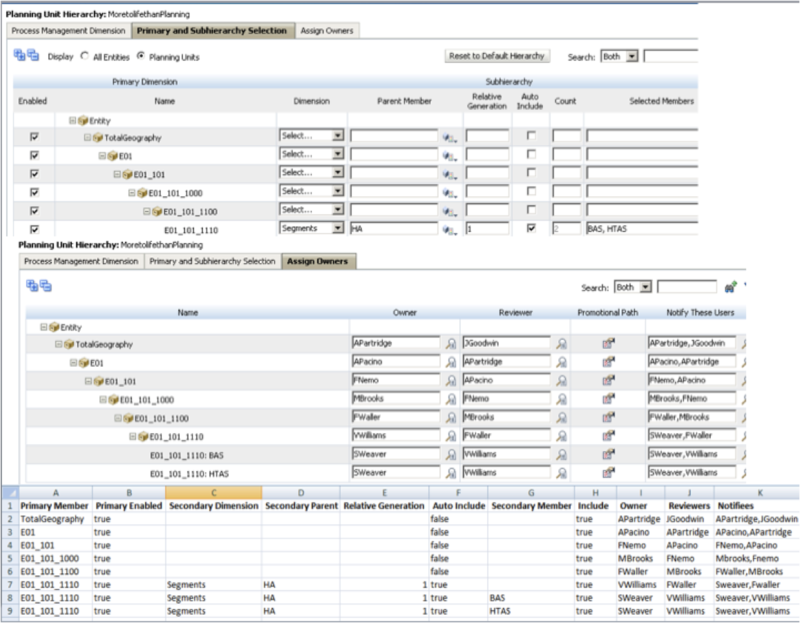 The “Primary and SubHierarchy Selection” and “Assign Owners” sections have been populated. I have included the file template again in the screen shot so it hopefully can help a little further in understanding how the various planning unit properties are populated from a source file. If any errors were encountered they will be written to the log defined in the parameters, more much more informative than when importing directly through planning. /U - Delete all planning units with the /R option, or display an error if members in planning units would be deleted. Use /-U (or do not specify the /U parameter) to prevent deleting members in planning units (default). Use /U with /R to enable deleting started planning units and deleting all members in the dimension specified in the .CSV load file. I did have a go at using the parameters but it didn’t seem to make a difference if I included them or not, maybe you will have more success with them. In the next blog I will look at the final method of loading planning unit hierarchies and that is through the use of ODI. This is the easiest method; create your planning unit template (look back at the previous blog if you have no idea on what to do) and make sure you save it with .exp extension. Here is the same source file template I am going to use. Each time you load a planning unit hierarchy it will drop any planning units in the existing hierarchy that don’t exist in the new one so make sure your template has the full hierarchy. Select the existing planning unit hierarchy name you want to load to from the dropdown. Click OK and the file will be loaded. 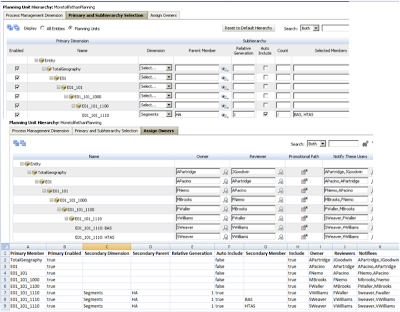 The “Primary and SubHierarchy Selection” and “Assign Owners” sections have been populated. I have included the file template again in the screen shot so it hopefully can help a little further in understanding how the various planning unit properties are populated from a source file. If there is anything wrong with the import source file you will receive the above error message and will have to hunt down the planning log. Not the best error logging in my opinion but at least you get an idea of the issue. In the next blog I will look at the next method of loading planning hierarchies and that is using the outline loader utility.